This spring with everything blooming at once, I have found it good to get into the garden early in the morning. The pollution level is at its lowest and the flowers at their best before the heat of our 70+ degree days stresses them. I try to take great photos, but alas, I can’t see to capture the colors I spot with my eye. For example, I took the two photos below of the garden, same spot and before and after the sun hit the leaves of the Spanish bluebells. No matter what I did with the camera, you cannot see the brilliance of the bluebells and violets I saw with my naked eye. Does my hand shake when I use my camera? Perhaps I am not handling this camera properly? Once upon a time I took great photos with my old Kodak camera, which used film. One thing I intend to do after I finish my program in May is get busy with a camera again. Perhaps I will take a course and learn how to use a digital camera properly? I really don’t want to lay out more $$ for a new camera, but needs must. Currently, I am using a little Nikkon but I think I will return to using my Canon Powershot. I am way off the topic I intended to cover today, which is volunteer plants in the garden. I have tried over the years to remove the violets, wild strawberry, English Ivy, and dandelions as they emerge. Last night our favorite TV weather guy told us that owing to the early spring, the weeds are out in force. I can see this myself. The “weeds” I list above are the nice weeds compared with some of the newer villains. By nice I mean they have a redeeming feature or two, whereas the bad weeds have none. For example take Dandelion. The weather reporter was lying on his tummy in the grass chomping on Dandelion greens. Heck, I have seen them for sale in the organic market. Commerce being what it is, these Dandelion greens were HUGE. OMG does this mean the weeds of the future will be supersized? Sometimes I want to choke those people who keep meddling with nature. Truth is, nothing is very natural anymore. Most of the forests we claim as our National Treasure date to the 1900s, when environmentalists began to fight the good fight, and many forests like our local Prince William Forest were planted in the 1930s. Even then, it takes all we have to protect them. How many folks are as bothered by Off-Road Vehicles as me? Why in the Hades does the government let them into nature preserves? Am I very wicked? Every time the gas prices escalate I laugh in my sleeve. I hate gas-powered vehicles. My biggest problem is with lawn mowers and leaf blowers, but off-road vehicles are next on the list. Unfortunately, the people who use these conveniences are those least affected by the price of gas. Get rid of all the cars on the road and we will still be plagued by lawn mowers. You see how easily I am diverted when the topic changes to air pollution. If you have asthma it is no laughing matter. What is the matter with people who blithely foul their own nest? Anyway, back to volunteers in the garden. I did not plant the violets, my neighbor did. Ditto the Spanish bluebells which now populate most of my flower beds. 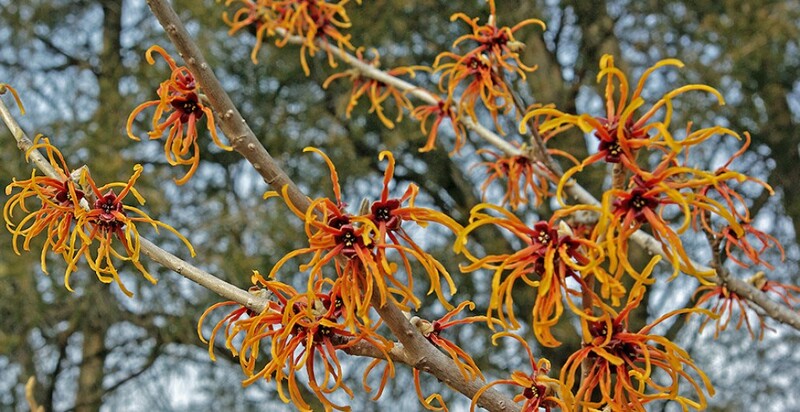 These little plants do extremely well in our area. I tried going ‘native’ a few years ago, planting things that are native to Virginia, and ridding myself of those plants that are not. 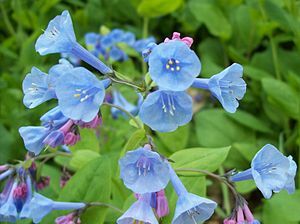 Toward that end, I planted Virginia bluebells (pictured below). The blue of these flowers if not as striking as the blue in the Spanish bluebells or the grape hyacinths or the Brunnera which have reproduced everywhere. However, the little plant I put in the ground last year has spread into a patch about 18″ across. This makes me wonder if the Virginia bluebells will join the other plants in a free-for-all? By the way, the little blue flower in the right lower corner of the photo is Brunnera which is indeed blue if not very large. I do love blue. Below is the Wikipedia photo of the Virginia bluebell. Maybe it is my camera? This entry was posted in Elder Blogger, Environment and Nature, Gardening and Gardens, Urban Spaces by SchmidleysScribblins. Bookmark the permalink. Sarah, I have recently begun to do more container planting, but the containers must be weeded occasionally too. Gigi, yes blue flowers rock. Friko, the eternal dillema. I can’t understand why it is so easy to get rid of the flowers you want and so hard to get rid of the flowers you don’t want. Al, of course I will recommend the push mower. That’s what we use. David is 82 and I am 70 and if we can do it, you can do it. If your lawn is bigger you may need to downsize so some younger person can do the mowing for you. It builds character. My yard is also full of weeds but I have learned most of them are edible so we co-exist. If times really get hard, I can always go out and graze. Well, Dianne, we could all pave over our lawns but that would use more oil than lawnmowers. When you come up with something better, I’m all ears (and please don’t say reel push mowers). I hate mowing the lawn. I love that you call self-seeders ‘volunteer’ plants. Self-seeders is so prosaic. I can’t agree that dandelions have a redeeming feature. They and their fleshy roots are a pest which I will never be able eradicate. They sit in my ex-grass daffodil patch and I can’t dig them up because I don’t want to harm the daffodils. The daffodils go, but the dandelions stay. Other volunteers I leave, just try to keep them in check. The Welsh poppy is beautiful but really can be quite a nuisance. I have loads of them and am always in two minds about them. How wonderful to see those blue flowers. We have them sometimes in the backyard. I want David to pull them out, as they are weeds that overtake the monstera plants. But, David really likes those blue flowers. We’re really just starting out with our garden. The first couple of years we couldn’t do anything as the neighbours kept having our garden (and terrace) in order to put in extra drainage for their property (we live in between two rivers). Then we had to work the soil and finally we put some grass down. We planted an apple tree 2 years ago and now we’ve started on little flowers and bushes. It’s very exciting. Especially at this time of year – seeing the changes as you describe. I think, perhaps we like quite similar flowers, those dainty little ones. And I love tulips too, like you have in your header. I don’t think you’re wicked at all! Thank you Linda. Yes, I know how it feels to want to be out there doing the things you once did. David and I pulled a few onions this morning. How noxious they are. Why don’t the pests who chewed on the tops of my tulips try a little onion? Beautiful weather beckons. Spring is wonderful around here. Happy gardening. The weeds with no redeeming characteristics are in full force here, too. I am getting closer to being turned loose by my therapists to be outside gardening on my own. I do exactly what they say cause I don’t want any setbacks in stroke recovery. But weeds and planting opportunities don’t wait! Lived your post, both on and off topic parts.